By understanding how the interview works and, crucially, what it is that the interviewer is looking for. The interviewer is not looking to catch you out, but rather for you to demonstrate your curiosity, knowledge and passion for Materials Science. You might be asked general interview questions so that the interviewer can learn more about you – review our list of General Interview questions to prepare. The easiest way to demonstrate your enthusiasm for Materials Science is to show that you are self-motivated and have studied the subject in your free-time for enjoyment – for example through online lectures and independent reading. If you don’t know where to start, review our suggested reading list below. The key to answering these questions is to always demonstrate your thought process aloud. The interviewer does not expect you to be able to answer every question immediately, but rather wants to determine that you are able to think about and work on unknown topics with confidence, intelligence and clarity – and they won’t be able to do that if you sit in silence! Use the list of questions below to prepare. Perhaps you can have a friend or relative ask you these questions so that you can develop your skills of thinking under time pressure and speaking out loud. Our Subject Interview Guides help you to prepare and go into your interview with confidence. Each guide discusses ten Oxford Interview Questions in depth with answers and approaches – along with possible points of discussion to further demonstrate your knowledge. They have been specially edited for applicants for each subject by a team of Oxford and Cambridge graduates. Download a sample page from our Physics Guide here. 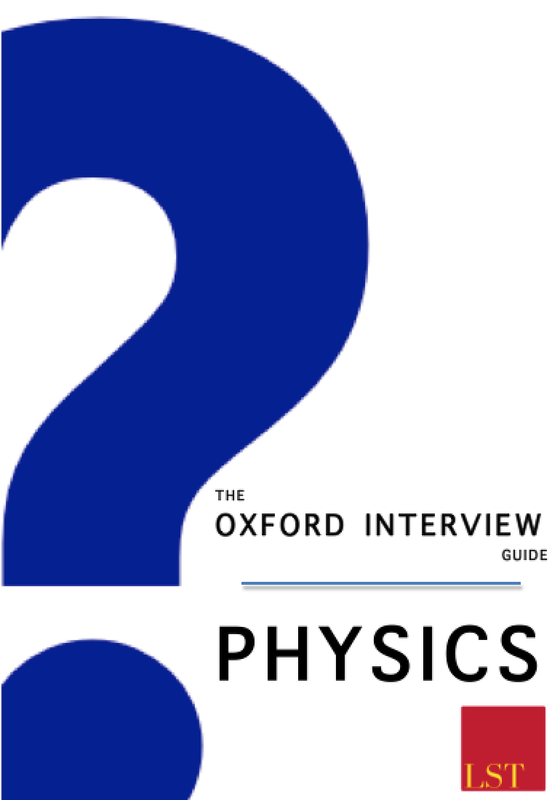 Please Note: Currently “The Oxford Interview Guide” is available for Chemistry and Physics (available to download below). Other subjects will be available for download in November – please enter your email below to receive a notification when your subject guide is available for download. Click below to receive your Oxford Interview Guide right now and you’ll be sent it in PDF format by email the same day so you can begin your preparation right away. 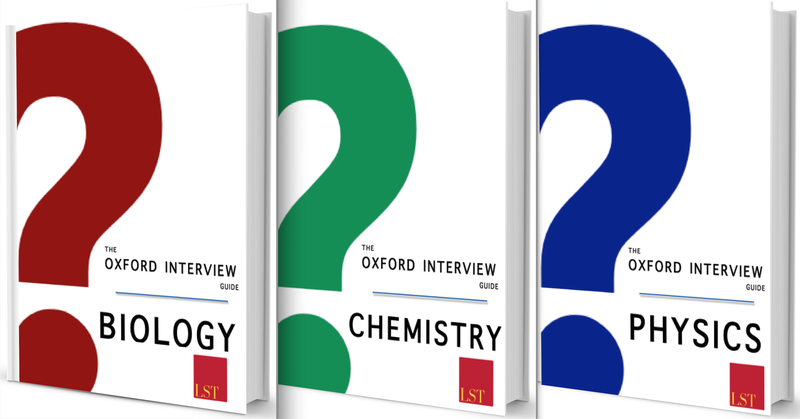 The Oxford Interview Guides are available to download now. Click the button below to receive your Oxford Interview Guide right now! When an ice cube melts in a glass of water, does the water level increase, decrease or stay the same? A tennis ball is placed on top of a basketball. The balls are dropped. To what height does the tennis ball bounce? How high can you go up a mountain on just a Mars bar? If you dig a hole right through the Earth and jump into it, what is your motion? If you leave a fridge turned on in a thermally isolated room, what happens to the room? If you could fold a piece of paper as many times as possible, how many times must you fold it to reach the moon? Sketch the displacement time and velocity time graph for a skydiver jumping out of a plane. Why can’t you light a candle in a spaceship? Two identical beakers with the same volume of water are placed on each pan of a double-pan balance. A steel ball is suspended from a string and submerged in the water of one of the containers. A hollow plastic ball of the same volume is submerged in the water of the other container and fastened to the bottom of the beaker by a string. Will the balance move, and if so in which direction? Can you think of a logical reason why stress concentrates on the bottom of a crack when you stretch a material? How do isostress lines in a crack develop and how would you locate them mathematically? If a human being was doubled in dimension would he jump higher or less high? What structure can prevent cracks in carbon fibre? If the world’s surface temperature were to rise by 20 degrees what would be the initial and then subsequent long-term effects? The objectives of the Department of Materials at Oxford University are to produce world class graduate materials scientists and engineers, and to conduct world class research into the manufacture, structure, properties and applications of materials, for the benefit of the UK and world community. Copyright © 2019 Oxford Interview Questions. All Rights Reserved. The Gridiculous Theme by bavotasan.com.